From the gentle landscapes of Finnish Lakeland to the treeless wilderness of the north, Finland is very much a “happening” destination. Get there before the crowds do. We sell more holidays to Finland than we do any other country in the world. That is probably because we’ve spent well over a decade exploring this country and pinpointing the best places and people to provide holidays for our guests. Exploring the wild fells and forests, sleeping in cosy log cabin accommodation, going snowmobiling and dog sledding in Finland, indulging in the freshest local cuisine, taking a sauna, hunting out the Northern Lights and making lifelong friends with the locals are just some of the arduous tasks our dedicated team have undertaken in order to bring our guests the absolute best of Finland. It has been tough. We’ve travelled to the country’s most northerly points to bring you holiday experiences in places such as Utsjoki and to its western border with Sweden for our holidays at Harriniva, Jeris and Torassieppi. In the East, we have established ourselves as the key UK partners for the sleepy log cabin village of Luosto. Our focus is on the smaller destinations, away from the crowds, where our local teams allow you to experience the country, its culture and its landscape in the best possible way. The bottom line is that we don’t think you’ll find another operator who is as passionate or knowledgeable about Finland. Just give us a call and speak to one of our Travel Experts and they’ll soon convince you. The North of Finland offers a wild landscape, where reindeer outnumber people. How you choose to enjoy it is up to you and our Winter Collection is a great place to start. Perhaps you want a real adventure such as our five-day husky safari, our Saija Lodge husky week or our snowmobile safari to the top of Finland’s highest peak. Maybe a tailored trip staying in a log cabin in Luosto or a winter cottage apartment at Ranua Wildlife Park is more your thing. 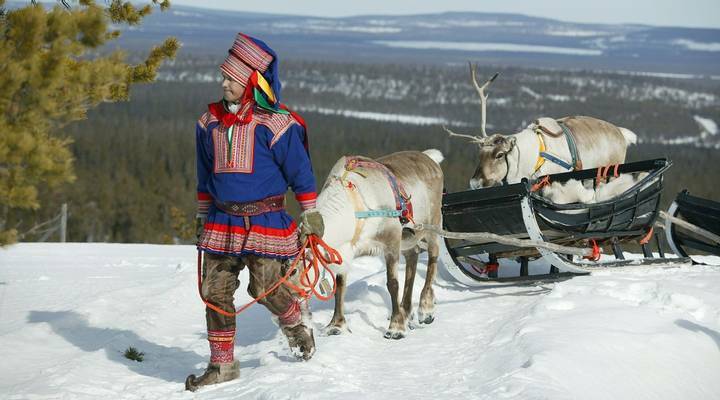 You can learn about Sámi culture in Utsjoki – the choice is entirely yours. What’s more, all of our Finnish destinations put you in prime Aurora hunting territory and we offer many different activities to get you on the hunt. From travelling in a 4 x 4 super jeep that takes you off the beaten track to taking your snowmobile out to incredible vantage points, our range of dedicated Northern Lights activities offers memorable ways to search the night sky. The key to our successful holidays in Finland is primarily down to one thing. Our friendships with the people we work with in the region. Through our extensive travels, we have built up personal relationships with our good friends in the North. We love to support local businesses, as well as pass on the many benefits that come with working with them to our clients. By working with local partners, we provide you with authentic holidays, so you get a real insight into a destination. What’s more, our partners are dedicated to offering you the best possible experiences of a location whilst looking after you like old friends. We always have guests returning from what they thought was a ‘one-off’ holiday to Finland who end up travelling back to this wonderful country time and time again. The people and the places we offer just keep pulling you in. In fact, many of us at Artisan Travel choose to holiday in Finland each year. From feeding the polar bears in Ranua to travelling to Jeris for some time in a winter cottage, before heading to the very north and staying at Utsjoki, deep in the wilderness. Each destination offers something unique, as well as the chance for us to catch up with the brilliant people who live and work there. There are not many, if any, tour operators who have invested as much time in locating these special places and people as we have. View our holidays to Finland here. Too often overlooked in favour of its neighbours, Finland is a much-loved travel secret whose time has well and truly arrived. Winter is the favourite time of year amongst the locals and you’ll see them taking full advantage of the pristine and snowy landscapes and the impossibly fresh air. Visit quiet places like Saija and Vuokatti and you can stand outside and hear the silence. Yes, it sounds corny but there is so little in the way of human population or industrial activity this far north and nature remains very much the dominant force. If you prefer somewhere a little bit busier then have a look at Luosto where the ski slopes attract visitors who want to combine their winter activities. Here, you can go dog sledding or snowmobiling in the morning and hit the slopes in the afternoon for a spot of skiing or snowboarding. Finland is rarely given the kudos it so richly deserves as a Northern Lights destination. The fact of the matter is that places like Jeris and Utsjoki witness just as many Auroral displays as any of Sweden, Norway and Iceland. Everything was taken care of from the moment we arrived at the airport in Finland. Torassieppi is a beautiful place with breathtaking views in all directions. Husky tour and snowmobile tour were a great experience which made my wife's 50th birthday very special (as did the kind gesture of a bottle of wine on the house and her birthday card - thank you so much). We were lucky enough to see the Northern Lights on our last night! Our stay in the Aurora Dome was very special as were the two trips we did. Difficult to pick a winner as they were all great. Absolutely wonderful weekend perfectly organised by Artisan. Thank you.